Michelle Homes explains how SAS Press books changed her life, and how she donates her books and time to the SAS community whenever she can. The post SAS Press books changed my life story! appeared first on SAS Learning Post. Editor's note: Charyn Faenza co-authored this blog. Learn more about Charyn. As the fun of the festive season ends, the buzz of the new year and the enchantment of SAS Global Forum 2017 begins. SAS Global Forum is a conference designed by SAS users, for SAS users, bringing together SAS professionals from all over the world to learn, collaborate and network in person. Sure, online communication is great, but it’s hard to beat the thrill of meeting fellow SAS users face-to-face for the first time. It feels like magic! To help you prepare for the event, Charyn and I wanted to share a few things including information on metadata security. Read on for more. Start your SAS Global Forum journey now! Want to stay up to date with SAS Global Forum activities, and get a head start on your conference networking? Join the SAS Global Forum 2017 online community. Here you can post questions, share ideas, and connect with others before the event. While you are at it, the SAS User Group for Administrators (SUGA) community also feels magical for me. As part of the committee, we regularly get together (virtually!) to discuss and plan exciting events on behalf of SAS administrators around the world. Join the SUGA community and watch for upcoming events, including a live meet-up at SAS Global Forum! That event is scheduled for Monday, April 3, from 6:30-8:00 p.m.
During his workshop at SAS Global Forum 2014, Gregory Nelson pointed out that the SAS administrator role has evolved over the years, and so has one of their key responsibilities: security auditing. Once you’ve set up an initial security plan, how do you ensure that the environment remains secure? Can you just “set it and forget it?” Probably not. Especially if you want to ensure regulatory compliance, to maintain business confidence and keep your SAS platform in line with its design specifications as your business grows and your SAS environment evolves. What would happen in your organization if someone accessed data they shouldn’t? When was your last SAS platform security project? When was it last tested? How extensive was it? How long did it take? Have there been any changes since it was last tested? Whether they are deliberate, accidental, expected or unexpected. How do you know if it’s still secure today? Our upcoming 301 paper will focus on auditing to complete the three ‘A’s (Authentication, Authorization and Auditing), including how you can use Metacoda software to regularly review your environment, so you can protect your resources, comply with security auditing requirements, and quickly and easily answer the question "Who has access to what?" 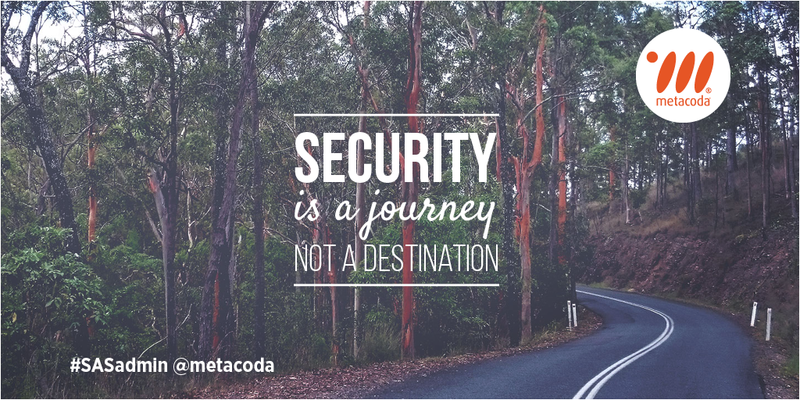 Whether you’re a new SAS administrator or an experienced one, you’ll know that security is a journey rather than a destination. To help make sure you’re on the right path, check out the SUGA virtual events, SAS administrator tagged blog posts, Twitter #sasadmin and platformadmin.com. If you’d like to chat more about SAS security auditing, please comment below, join our chat in the SAS Global Forum community, or connect with us on Twitter at @HomesAtMetacoda, @CharynFaenza. 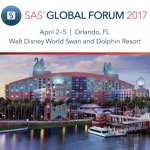 Looking forward to seeing you in April at SAS Global Forum 2017 in the enchanting and magical Walt Disney World Swan and Dolphin Resort, Orlando, Florida! Ms. Faenza is Vice President and Manager of Corporate Business Intelligence Systems for First National Bank, the largest subsidiary of F.N.B. Corporation (NYSE: FNB). An accountant by training, she is passionate about not only understanding the technology, but the underlying business utility of the systems her team supports. In her role she is responsible for the architecture and development of F.N.B.’s corporate profitability, stress testing, and analytics platforms and oversees the data collection and governance functions to ensure high data quality, proper data storage and transfer, risk management and data compliance. Throughout her tenure at F.N.B. her experience in data integration and governance has been leveraged in several cross functional projects where she has been engaged as a strategic consultant regarding the design of systems and processes in the Finance, Treasury and Credit areas of the Bank. Ms. Faenza earned her bachelor’s degree in Accounting from Youngstown State University where she is currently serving on the Business Advisory Board of the Youngstown State University Laricccia School of Accounting and Finance. Take a SAS security journey at SAS Global Forum 2017 was published on SAS Users. We live in a world of acronyms, or rather TLAs, and SAS user group names are renowned for them. Last week I received a comment about one of the Australian user group names, and it got me thinking how did these names come about? What is their history? and to share the SAS ANZ groups with the wider SAS community (now that SANZOC is a public group). Being a SAS user you probably know about the annual SAS Global Forum (previously SUGI - SAS User Group International), which I've incidentally heard named "GloFo", and many regional and local SAS user groups around the world. So, what about you... do you have a favourite SAS user group name and do you know a bit of their history? You may be interested to see some background on SAUSAG - Blast from the past... SAUSAG name - other memorabilia? 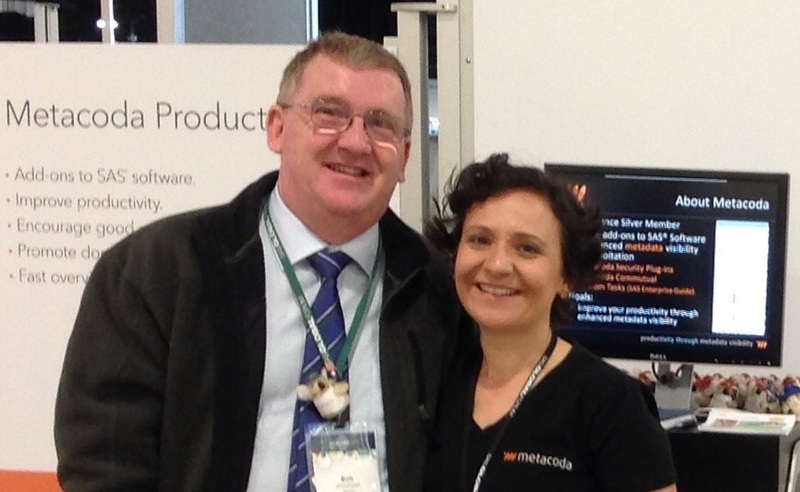 Editor’s note: Bob Whitehead has been a SAS user for 30 years and won his first trip to SAS Global Forum! Both Michelle and Bob Whitehead are members of Western Australia SAS User Group (WASUP). This excerpt from Michelle Homes’ post on the SAS blog Left of the Date Line tells the story. The New Year brings fresh opportunities, and 2014 is an exciting year for SAS users in the Australia New Zealand (ANZ) region to form connections, share ideas and get inspired! Keep an eye out for Bob’s presentation on his experience at SAS Global Forum 2014 at the Q2 2014 WASUP meeting in June. These comments come from SAS users across the entire ANZ region at all levels of knowledge and experience. I am sure you will agree that presenting at a user group can be encouraging and valuable for all SAS users and students in our left-of-the-date-line community. With the SUNZ conference in Wellington, New Zealand on the 18th February, and plans underway for the 1st quarter Australia SAS user group meetings, now is your opportunity to share the work that you have done, be recognized by your peers, and be rewarded personally and professionally for achieving your goals. And don’t forget the MAIN PRIZE, a chance to win a trip to SAS Global Forum 2015! If you are interested in presenting at a SAS user group meeting this year, let your SAS ANZ user group committee know before the presenter slots are filled! SASuser power! Does this phrase conjure up any images for you? I visualize SAS users across the globe, addressing messy data, combating fraud, and making use of business analytics to provide insight and add business value for organizations around the world. We, SASusers are powerful! With the Potential of One comes the Power of All and, fittingly, this is the theme for SAS Global Forum 2014 (#SASGF14). 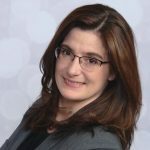 Conference Chair Marje Fecht shares her POWER-ful advice for preparing your bright ideas in her message on the SAS Global Forum site. The call for content for SAS Global Forum 2014 is now open. This is an opportunity to share your knowledge and experience with the SAS global community. As I mentioned in a video interview with Vince Cotte at SAS Global Forum 2013, SAS Global Forums are THE place to connect with SAS users and meet with SAS Research & Development. Alongside other SAS users, SAS Institute staff, customers and partners you can learn about upcoming releases in the SAS product offering, leverage the many opportunities to network in person, see live demonstrations, attend presentations, or even give a presentation. We are now into the second half of 2013 and it is a busy time for SAS users with upcoming forums in Europe and regional user groups in the US to name but a few. In Australia the SAS Sydney Forum was held earlier this month, which drew over 1,000 attendees for this fantastic one-day event. One of the many highlights of the event was the discussion of SANZOC (SAS Australia New Zealand Online Community), an online community for SAS users in Australia and New Zealand. This is a wonderful resource for SAS users to collaborate, network and share information outside of their usual SAS user group meeting or major forum event. Attending SAS Global Forum 2014 need not be a challenge… Start planning now, read the Five Reasons to Attend SAS Global Forum, consider submitting content – quick tips, presentation, poster or hands-on workshop, plan to register (registration opens October 2013) and use the opportunity to discover Washington D.C. while in town too. Please share in the comments below your thoughts on what SASuser power means to you and whether you’re planning to attend and/or submit content for SAS Global Forum 2014. I’ll be there, so be sure to say “G’Day”. Recently I wrote about the importance of “Looking before you leap” as part of the data exploration phase within the Analytic Lifecycle. The importance lies in our need to maximize our time to make informed and accurate business decisions. As we undertake our journey through the Analytic Lifecycle towards building a model and beyond, being time efficient and accurate is key. You may be familiar with the George E.P. Box quote “essentially, all models are wrong, but some are useful”. So how can we build a useful model with big data and little time? A powerful driver in business that’s common across many industries is the ability to use the data of the past, to provide an accurate picture of the present, to predict the future. We need to easily create, explore and interpret our analysis and visuals as we progress through the model building journey. This in turn, not only validates the insights gathered, but also the decisions we make in developing a model. Additionally we need to ensure we can easily monitor our insights over time, as our business changes, and with the increasing volume of historical data. As Vincent Cotte points out, organizations are easing their growing pains with data visualisation using SAS Visual Analytics’ advanced analytic capabilities; companies can more rapidly travel the path to building a useful model. Using the freely available SAS Visual Analytics Full Demo I thought I’d delve further into my previous exploration, looking at customer satisfaction and sales representative ratings with the toy company data. Looking at the 15 years and 3.6 million rows of data, I decided to build a correlation matrix with all the measures to see the degree of linear association between them. Within a few seconds, on 26 measures and 3.6 million rows of data, a correlation matrix appeared. The dark blue cells indicate a strong linear relationship and we can see that the intersection of Customer Satisfaction and Sales Rep Rating has a correlation value of 0.9867 (very close to 1). Double clicking on the selected cell I can then explore the linear relationship further with the regression visualisation automatically generated by SAS Visual Analytics. We can then see there is a strong linear relationship between Customer Satisfaction and Sales Rep Rating with the intersection of Customer Satisfaction and Sales Rep Rating cells clustered around the line. As seen below, the graduated colours for the regression visualisation cells represent transaction frequency. The graduated colours for the regression visualisation cells represent transaction frequency. To assess the relationship of Customer Satisfaction and Sales Rep Rating against our bottom line we can easily change the measure from Frequency to Gross Margin by dragging Gross Margin from the selection pane on the left to the visual pane on the right. So now the graduated colours represent Gross Margin instead of Frequency. We can also see that the highest gross margin transactions are those with the highest customer satisfaction level and sales representative ratings. A good sign that we will look into next! You may also notice a grouping of lighter blue cells (as circled below) that indicate some unsatisfied yet still profitable customers who are managed by some of our lesser rated sales representatives. This is something that may warrant some further investigation. At this point perhaps we need to reassess our focus and determine where to go next. Where are we at in the Analytics Lifecycle? Are we still in the data exploration phase or variable selection phase? Do we want to gain some further insight into our highest gross margin transactions? Maybe a task we were also given was to assess our most profitable products, so we decide to focus on our highest gross margin transactions to see what products they may relate to. By using the mouse as a lasso, we can highlight the blue and white cells in the top right corner as seen in the screenshot below. Right click on the selection and select Include Only Selection. This will create an instant filter for the data we want to focus on. Moving away from the transactions with the highest customer satisfaction and high sales rep rating, we substitute Customer Satisfaction for Product Line. This shows us the highest gross margin products for our most satisfied customers. The highest gross margin products for our most satisfied customers. The screenshot below shows the intermediate step where, for this subset of data, we can see that Plush toys provide our highest gross margins. Plush toys provide our highest gross margins. In the final step, we select bar chart from the menu bar and replace Sales Rep Rating with Gross Margin Ratio. Now we can see that plush toys, for satisfied customers, have the highest gross margin and percentage contribution – in fact more than double any other product in this view! SAS Visual Analytics has helped us with these phases in the model building journey. One user has been able to explore the relationships for millions of rows of data quickly and in an intuitive web-based interface. Please share your thoughts and insights in the comments below. Do you think SAS Visual Analytics can save you time in your journey to building a useful model? Start your own journey - try it for yourself for free right here. Have you ever been in the situation where you have said something before thinking? Or perhaps been too rushed to take the time for a final review before the deadline? We live in a busy world where we need to maximise the time we have to make informed and accurate business decisions. How we do this in our working day as a manager, analyst, modeller, programmer, data scientist, administrator etc, typically varies depending on the skillsets we have, the software we are familiar with and the time we have to do it. If only there was a way to look before you leap and make those informed and accurate decisions using a platform that everyone in the organisation can easily and quickly use … well there is with SAS Visual Analytics! In order to be a more effective decision maker we need to have the ability to spot patterns, identify opportunities for further analysis and convey results quickly. To achieve this in tabular reports alone is difficult as people tend to more naturally interpret a visual. Data visualisation is key in order to make better business decisions and it is within the Analytic Lifecycle of Data Exploration that I would like to share with you how easy it is, for anyone in an organization, to gain those insights using SAS Visual Analytics. Using the freely available SAS Visual Analytics Full Demo I thought I would role play a Marketing campaign analyst wanting to know whether there needs to be a worldwide campaign to improve customer satisfaction levels for my toy company. Looking at the 15 years and 3.6 millions rows of data, I start my ad-hoc data analysis and discovery journey. In the screenshot (below) we can see the average customer satisfaction level with the average product quality over time. This bar chart seems to suggest that the customer satisfaction levels are consistent over time. However we are not looking at this geographically. Average customer satisfaction level with the average product quality over time. By selecting the Geography Hierarchy from the data pane, I can quickly view the customer satisfaction levels and product quality by geography. Here we can instantly see that there is a difference in the customer satisfaction levels between Africa and South American and the other regions. This starts to raise some questions – primarily why? So perhaps a richer perspective is needed and by clicking on the Box Plot chart type we immediately get another view of the data showing the distribution rather than the average at each region. Box Plots are a very powerful way to derive multiple statistics about your data. A box plot represents the distribution of data values by using a rectangular box (where 50% of your data lies) and lines called whiskers and by hovering over the box you get to see the derived statistics. So what we saw before in the bar chart were the averages and now we can see the distribution of our customer satisfaction levels in our regions. I am curious as to the spread of the data in the South America region. Why is the range so wide, from 24% to 100%, so by drilling down through the Geography Hierarchy (double-clicking on the box plot), we can see the distribution of the customer satisfaction levels and product quality at the country level within South America. What are the causes of these unexplained and geographical country differences? Perhaps it was a misunderstanding of the scale in the customer satisfaction survey in some of the countries (reverse order) or perhaps another reason? Maybe another data item can provide us some further insight… By adding the Sales Representative rating within our chart we can now see that the regions with lower customer satisfaction levels tend to also have lower sales representative ratings. Mmmmm this might change my initial thought from a worldwide campaign to a more targeted campaign in these specific regions perhaps with the involvement of sales representatives? Or maybe I need to further investigate this to see if there is any impact by year or filter the data for only the last year. In any case, by spending less than ten minutes to visually explore a large volume of data, detecting potential patterns/trends or outliers can be achieved via drag and drop functionality, by the same individual, in the same interface allowing one to look before they leap. You can experience the freedom of data exploration with SAS Visual Analytics yourself and please share in the comments below your thoughts and insights. What would you like to have the time to look at further before you leap into analysis? Experience it now - try it for yourself for free right here.